In the 1920s, Hazel Kyrk, a researcher at the University of Chicago, looked at a concept called, “home economics” (Hira). This was a brand new area of study that emphasized the personal responsibility of individual and family money management. Through education, it was found that people would make smarter financial decisions. Eventually, “home economics” became “personal finance.” This slight variation in names likely contributed to a rise in the personal culpability of one’s financial decisions. If you were given the proper education, tools, and were of reasonable intelligence, personal finance could help you budget, plan for the future, save for your dream home, and retire at a reasonable age. Personal finance sets a standard of individual responsibility that is admirable, necessary, and vital to a motivated economy. Unfortunately, this framework is too simplistic to accurately appreciate our current, complex markets (e.g., credit default swaps, derivatives, zero-interest loans, and bundled home mortgages). We now live in an economy that besmirches and vilifies those who are struggling to make ends meet. Fox News suggested that those who protested against big banks, stood for tax reform, and filled the streets looking for change (i.e., Occupy Wall Street protests) were simply looking for handouts from the government. By their standards, these lazy, narcissistic Millennials hadn’t paid their dues – they weren’t worthy of their protest. Suddenly, reasonable financial reforms, argued via peaceful protest, were seen as class warfare – a scourge that nobody should stand for. The irony is that every bit of evidence points to wholescale, systematic actions that defeat the lower and middle class, effectively preventing them from being able to properly engage in personal finance. Many of the wealthiest 1% of this nation are engaging in a ruthless political battle to protect more of the financial pie. With record high income inequality, police action on peaceful protests, big bailouts for bankers, and a cycle of self-victimization, this is the real class warfare. Police, the War on Drugs, protests, and more! As a nascent resident assistant, I grew to love my on-campus, university police. The police were a friendly bunch that helped immensely when physical assaults, verbal abuse, and when serious health complications arose. But a couple pivotal moments also occurred during this time that tempered my admiration for police: First, I was contributing to the wholesale punishment of minor drug offenses (e.g., calling out students that were smoking marijuana in the halls, which would eventually become legal in my state). Second, YouTube and various media outlets showed vicious beatings and law enforcement abuses of students protesting inequality. In both instances, people were punished severely for minor offenses or mere inconveniences to established populations. Increasing emphasis surrounding the “War on Drugs” led to the Rise of the Warrior Cop. Essentially, officials pumped billions of dollars to feed and encourage the prosecution of low-level drug offenders. By arresting and taking out these small-time criminals, enforcement agencies received more kickbacks from the federal government. Special Weapons and Tactics (SWAT) teams became a popular “necessity” for any working police force, as no-knock raids became a popular highlight of service. Only after SWAT teams broke through the door of this mayor’s home, killing both dogs, and holding the family at gunpoint, did they realize this was the wrong house. While never admitting fault, the police eventually declared that the mayor was innocent, and that the package of marijuana was part of a larger ring of smugglers – not associated at all with Mayor Calvo. This may be but an example of the excessive use of force on innocent people, but there’s an epidemic of these tactics. In Berkeley, California, during the Occupy Wall Street protests, students gathered peacefully. They were arguing for financial reform and serious change. The administration and on-campus police forces grew tired of the campsites and wanted to forcibly remove them from the lawns. Arm-in-arm, the students stood firmly against the police force’s new interdiction. But despite their peaceable assembly, the police dragged, beat, and slammed the weaponless professors and students. In 2007, a massive financial crisis tanked pensions, bankrupted banks, and sent the world economy into a massive recession. Behemoth banks like Lehman Brothers shuddered their staff and went belly up. Bear Stearns, despite being rabidly recommended by stock guru, Jim Cramer, became a single digit stock before being swallowed up by a competitor. Each news report was worse than the last, and there didn’t seem to be an end in sight. Wall Street and Main Street seemed to conjoin at this time of economic disfunction. Everyone needed to work together to bring back our economy. People were encouraged to keep spending, traveling, and consuming. As wages stayed stagnant for lower and middle class employees, upper income salaries continued to climb at astronomic amounts. Seemingly, the more those wages increased, the more unemployment statistics increased. The correlation was undoubtable, and money was getting sucked up by a select few. The worst trickery came in the form of “too big to fail” economics. Banks had metastasized beyond healthy size. To let major banks fail would’ve led to full-scale economic ruin. Insurance policies, pension plans, and much more would disappear because of one company, AIG, alone. The federal government stepped in to “save” the big banks, handing them a poorly recorded ledger that held the keys to tiny interest rates and flexible return dates. The banks would be able to keep lending! The success of bailouts was met with financial reward for the highest echelons within the banking world. Despite the monies intention, to keep lending to those in need, executives received record salaries and bonuses directly from taxpayers’ wallets. The rich asked for a handout – demanded it – and got it. But the lower and middle income classes didn’t financially improve and benefit from the major bailouts; rather, stagnation continued. Nevermind Fox’s “Entitlement Nation” segment, this was “Entitled Elite Nation.” Where was Main Street’s bailout? The Wolf of Wall Street catalogs the grift and greed of former swindler, Jordan Belfort. In a classic pump, dump, and commission system, Belfort made millions by ripping off people that didn’t know much about investing. There’s a scene in the movie that shows the staff of the corrupt investment firm admitting no wrongdoing, because they simply “could not remember” or “recall”… well, anything. As I sat through this part, I laughed aloud – this was exactly what Lloyd Blankfein, CEO of Goldman Sachs, and his boys did in broad daylight to Washington politicians. Fueled by a large cadre of layers, Goldman’s staff admitting nothing, forgot everything, and looked shocked by the allegations of wrongdoing. Rather than be chastised and censured, the executives were treated like princes – geniuses of business. This kind relationship between business interests and politicians has long been present, but has progressively declined in recent years. With the painful introduction of corporate and wealthy interests paying for elections via Citizen’s United, lobbying power has grown to epic proportions. It’s far more easy for moneyed powers to meet and arrange times with Congressmen and the Executive Branch. Billions of dollars are being spent yearly on Washington-based lobbyists, and they’re warring against lower and middle class values (by in large). The Citizen’s United court ruling may have suggested the corporations were people, too, but they sure don’t show it. From the Keystone XL pipeline to financial deregulation to tax holidays to reduced capital gains taxes, the wealthy are having their say while the majority miss out. Brilliantly, maniacally, Fox News jettisoned a perverted phrase into the ether and attempted shut up those who were suffering under crushing income inequality. Class warfare was stolen and misappropriated by the richest for the richest. Critique, protest, and concern was met with this singular phrase: class warfare. To villainize those with modest means when they ask for help and hope during record-breaking, inequal times (see Inequality for All ) is a horrific moral atrocity. The surprising amount of people that believe that the American Dream is alive and well are sorely mistaken. In a way, there’s an egoistic, narcissistic self-victimization and cycle that the most affluent who lobby against reforms are propagating. The message encourages you to pity the rich, as their lifestyle is under attack. Class warfare is a tragic thing to be a recipient of, but that misses the request and reality. People are arguing for modest reforms, not a hatred of the wealthiest 1%. To, in turn, villainize the rich defeats the purpose and point of this article. Wealth is not inherently bad, and should be encouraged to some extent. Wealth creation and capability adds to a vibrant entrepreneurial foundation that is at the heart of the American Dream. This is not a country that should squash this zeal for industry, but real reforms must still occur. Regulations, income tax reforms, capital gains tax increases, and massive funding for educational programs may be a lot to ask, but we need these things to continue to prosper as a nation. Right now, staggering income inequality is holding us back from reducing our massive deficit and debt (from individuals to our entire country). Sensible solutions may be found in “The Buffett Rule,” which asserts that the capital gains taxes are out of date for the amount of wealth that’s held in stocks. The idea was started by Buffett, when he pointed out that it made no sense how his secretary paid around 30% income tax, while he skated by at around 15%. One of the richest men ever was arguing for modesty at a time of great immodesty. The bill and proposal would’ve only affected the wealthiest 0.3%. Even this was struck down by the “do-nothing” Congress. Fox News and corrupt elite misappropriated and annexed the term, class warfare. But they don’t deserve the phrase – it’s not theirs. 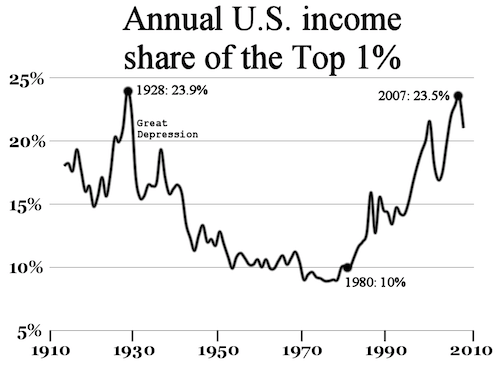 Not since 1928, have we seen such blatant inequality. Attempts at peaceful protest are being beaten down by riot and SWAT police, and hampered by economic hardship of the masses that makes them “Too poor to protest.” The largest bailout packages ever were delivered to the Wall Street elite, and Main Street sat back and suffered – there wasn’t a handout to the average Joe. The worst, most disgusting portion surrounds the self-victimization of the Fox News elite – whining like they are under attack from their cathedrals of drivel. As Russell Brand suggests, perhaps it’s time for a reevaluation of our political system. Money has destroyed politics and those who care to serve the majority. Individual voices are drowned by the moneyed powers. We are living in a political dystopia. The only question that remains: What will we do about it? Frugality is a necessity for some, and a choice for others. There are many opportunities to spend carelessly – the Starbucks around the corner, that new gym membership, or going out to eat all the time. It takes serious effort to save money and spend less. It’s far harder to find ways to lower your bills and balance a budget. At some point the desire to be frugal can fade when wealth, affluence, and income increases. How much money would you need to make per year to relax or throw away your budget, and say goodbye to the frugal life? Would you? For many, becoming wealthy entails a certain level of privilege, posh, and the ability to spend wherever you want – without much care or a budget. Riches generally come from a combination of income and savings. Without any savings and a hearty salary, you’re likely vulnerable to economic turmoil. Without an income a moderate savings, you could be in trouble, too. How much liquidity is in your checking accounts? How much do you make per year (and what tax bracket does that put you in)? What kind of liabilities do you have (e.g., loans, debt, future payments)? Have you ever compromised your lifestyle due to economic turmoil? Only 2.9% of earners make more than $250,000 a year (CNBC). On a nationwide and worldwide scale, many consider this to be wealthy. But some people within this income level hesitate to call themselves rich – identifying more in the upper middle class. The new rich still get to decide which elite private schools to send their children, live in high cost of living areas, and have more job security. On an international scale, these riches are incomprehensible to abject poverty. Nobody should have to live like this. Unfortunately, as the world economy has largely recovered from the disastrous housing bubble and mortgage crisis, many lower and middle income families have missed out on income gains. It’s no longer a dream to have more than you need – it’s an expectation. People in lower and middle class incomes don’t think they have it – they probably don’t – and those in the top percentages for earners seem to be denying their wealthy status. There’s a complicated interplay between this income status and the federal government. Those filing individually at the $200k or married at the $250k levels have their marginal tax rates increased significantly. A marginal rate suggests that you get taxed at the traditional rate up until the income limit ($250k in this example). In recent years, President Obama focused on the $250k income line and greater for increased taxes. Part of the proposal for tax reform included breaking down income brackets and increasing the marginal rates for those in the highest levels. Regardless of where tax reform goes from here, there has been a target on the back of the $200k/$250k level. This campaign to define the wealthiest class and tax them more has bred a hearty argument on a variety of news sites. Try supporting a family of 5 on $250,000/year in the SF bay area. The cost of living here is so high and I’ve got 3 kids. It does not seem fair to tax me the same as someone making $250,000 per year in, say, South Carolina where housing is less than 1/5th the cost. The potential tax should be more thoughtful and consider local cost of living. People that make $250,000 already pay close to half of their income in taxes. Federal, State, Local, Social Security, Medical…leaves you with $125,000. Family of 5 automatically puts you in a “no financial aid” status for your kids in college. Overwhelmingly, the comments suggest that this income level is on the precipice of riches. Many feel vulnerable, as if they could lose this status. While they can live healthy lives, they are taxed heavily, the target of much tax reform, and generally live in high cost of living areas. Then, there are the government subsidies, kickbacks, and write-offs that the $250k level cannot easily attain. These cost savings that lower income classes can receive effectively make living even more expensive. The government proposes that people at this level don’t need as much help paying for college and saving. As lower and middle income classes have seen social support and welfare programs devastated by government bureaucracy and cutbacks, the $250k group has actually become more vulnerable – in a sort of middle-ground that gets the least support, protection, and understanding. They’re economically unprotected, and this leads to a fear of losing this income level. When I first started writing this article, I wanted to make it clear that this income tax bracket is very rich. Honestly, they have an incredible privilege of choice that is granted to very few. But with the collapse of social welfare, support, and market troubles, this bracket is in an economic no-mans-land – you either go up or get out. A family with a combined income around $250,000 a year may not feel rich. When the international economic world is studied, they are the richest of the rich. The average salary here in the States is still around $50,000. But in America, there is a well-warranted fear about the future status for those earning this much. This is why frugality spans vast demographics. Most everyone can find reasons to save for tomorrow. When you are trying to earn and invest, but feel vulnerable to economic shifts, finding a budget and healthy spending habits can save you. Somewhere along the way we were duped into thinking that everyone needs more stuff, and that success is measured by how much we’ve amassed before our inevitable demise. We can’t buy ourselves out of death (yet), but we can provide help, support, and hope to those truly in need. Have you ever wondered how much you need to make/amass to stop working, consider yourself rich, and/or feel financially secure?